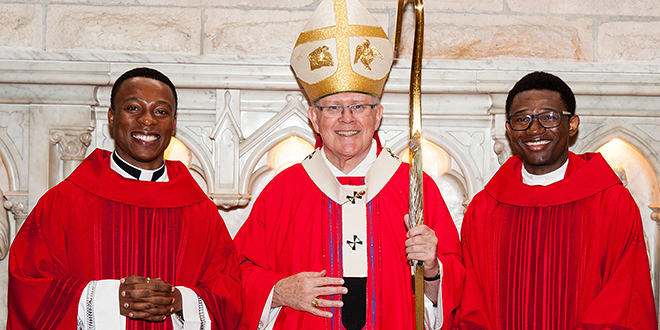 This is Archbishop Mark Coleridge’s homily from the Mass of priestly ordination for Fr Odinaka Nwadike and Fr Paul Eloagu at St Stephen’s Cathedral, Brisbane, on June 29. EARLY in life they would have seemed two ordinary enough young Jewish men – one a budding businessman, the other a promising rabbinic scholar. One had been born in far-flung Galilee and settled on the shore of the lake; the other had been born in the diaspora, in even further-flung Tarsus, but had moved to Jerusalem at an early age, it seems, to pursue his studies. The first was named Simon, the second Saul. Saul was more evidently religious than Simon, but both had a religious experience that would change their life forever and would end up costing them their life. It was an experience of encounter with the man named Jesus. Simon met him on the shores of the lake while engaged in the family fishing business. It was a casual enough encounter at first, but one thing led to another – and Simon eventually left everything to follow Jesus along the roads of Palestine and beyond. He would eventually be one of the twelve apostles chosen by Jesus to be sent out and also one of the three-man leadership team – James and John being the others. In fact, Simon became the leader of the twelve after a mysterious exchange between Jesus and him, the story of which we have heard in the Gospel just proclaimed. It was here that he acquired the nick-name by which we know him – Peter, the Rock upon whom the Church is built. For Saul, the encounter with Jesus was different. It’s almost certain that he never met Jesus in the flesh, although he may have been in Jerusalem at the time of Jesus’ public ministry there. So he may well have heard of him and even seen him. But Saul’s encounter happened on the road to Damascus, and it was even more a bolt from the blue than the call of Peter. The persecutor was knocked down and stripped of all power. But then, empowered by the one he had been persecuting, the great persecutor became the great proclaimer – a true apostle, he insisted, even though he hadn’t been with Jesus and the twelve from the beginning. The name Paul was not given to him by Jesus, but would have been the common Roman name used by Saul from an early age in a Hellenistic culture where his Semitic name, Saul, would have been odd and difficult. Eventually the two men who had met Jesus met each other. It was after Paul’s Damascus Road encounter when the former persecutor was still regarded with great suspicion by the Church in Jerusalem. Barnabas was the diplomatic bridge across which Paul made contact with Peter. They spent a fortnight together in Jerusalem exchanging stories and information – Peter telling his story of meeting Jesus and what followed, Paul doing likewise. They agreed on a tactical withdrawal of Paul to Tarsus until things calmed. Their ways then parted for some years. It was only with the unexpected surge of the Gentile mission in Antioch that Paul reappeared – again because of Barnabas who’d been sent from Jerusalem to discern what was happening in Antioch. One crucial discernment he made was to recruit Paul for the leadership team there. Barnabas and Paul were then two of the three-man mission team that took the Gospel beyond the shores of Palestine for the first time. Peter eventually joined them in Antioch after their return from the mission. Like Paul and Barnabas, he was happy to share a common table with Gentile Christians, even though it had been unthinkable for a Jew to eat with Gentiles. But when some Jewish Christians came from Jerusalem, they were shocked to see the table-sharing and insisted that there be a separation of Jew and Gentile. Peter and Barnabas agreed to a tactical withdrawal for the sake of peace. But Paul refused absolutely, accusing them of betraying what God had done in Jesus, breaking down the walls between Jew and Gentile. At this point, Paul decided fatefully to set up his own mission team. He went one way; Peter and Barnabas went elsewhere. At stake was the understanding of what the Church was. Was it a sect within Judaism, or was it a new and distinct intervention by God, born from Judaism but no longer a sect within Judaism? Implicitly, Peter and Barnabas thought the first, at least according to Paul; he very explicitly thought the second. In the long run, Paul was right. Paul went his own way (with Silvanus and Timothy), but he never disputed the unique authority given to Peter by Jesus, and he strove through the years to build bonds of communion with the mother Church in Jerusalem. Eventually, both Peter and Paul ended up in Rome, and it was there that they met their death – Peter crucified in Nero’s Circus on the Vatican hill, Paul beheaded on the road to Ostia. Peter was buried nearby where St Peter’s Basilica now stands, Paul was buried in Lavinia’s vineyard where St Paul’s Basilica now stands. The two churches are great tombstones, but also memorials to the splendour of the undying witness of the two apostles. Those who fought and went their separate ways in life were united in death. They were so perfectly conformed to Christ in their death that they became perfectly one. That’s why we celebrate their feast on one day, June 29, and why we venerate their memory most intensely in one city, Rome. Tonight we ordain two young men to the priesthood – that is, to follow in the footsteps of Peter and Paul, which are the footsteps of Christ. Like Peter and Paul, they have a similar background and culture, but they are quite different men; and it’s certain that their paths in the priesthood will be different. They may have their disagreements, even their fights. But both have encountered Jesus; both have been claimed by him, by the Lord whose claim is total. They are ordained not to be self-serving Church functionaries but to be both missionaries and martyrs. Their missions will be different, as were the missions of Peter and Paul. Their martyrdoms will be different, as were the martyrdoms of Peter and Paul. But if they are not, in their own way, missionaries and martyrs, they will not enter into the priesthood of the Lord crucified and risen. They will be part of the problem, not part of God’s solution. If Odinaka and Paul can enter more and more deeply into the life of mission and martyrdom, then they will be servants of the communion which is in Jesus, breaking down walls to build up the Body of Christ in unity and peace. Then at the end of what we hope and pray will be a long and happy life in the priesthood, they will be able to say with the Apostle, “I have fought the good fight to the end, I have run the race to the finish, I have kept the faith”. To Odinaka and Paul, we speak the Apostle’s words of reassurance and encouragement as we look to the future: “The Lord will rescue [you] from all evil attempts on [you], and bring [you] safely to his heavenly kingdom. To him be glory for ever and ever. Amen”.